Last month, the Chinese People's Liberation Army Air Force announced that they're releasing a mobile game. Now, after a month and much hoo-ha, they've finally released some additional information. Titled Golden Helmet, the game is named after a ridiculous military exercise to find the best pilots. Now, after some hype, the first video of the game is available and it looks pretty good. Here, check out the promo video. 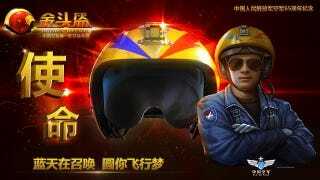 Made probably to educate (or maybe brainwash) Chinese youth about the glories of the air force, Golden Helmet was announced to celebrate the 65th anniversary of the PLA Air Force. The above video was actually released on the date of the anniversary, 11/11, aka Singles day. This of course isn't the Chinese military's first foray into making video games. Previously, the Army has worked with Chinese games publisher Giant Interactive to produce Chinese FPS Glorious Mission. That game wasn't that great, being a major cash grab. Just looking at the video and available screenshots, Golden Helmet looks pretty good. However, knowing that it's an official Chinese game with probably ultra nationalistic intentions, one can expect the game to be pretty "meh," but I could be wrong. I hope I'm wrong.